The AVC announces the start of Fall 2013 classes! 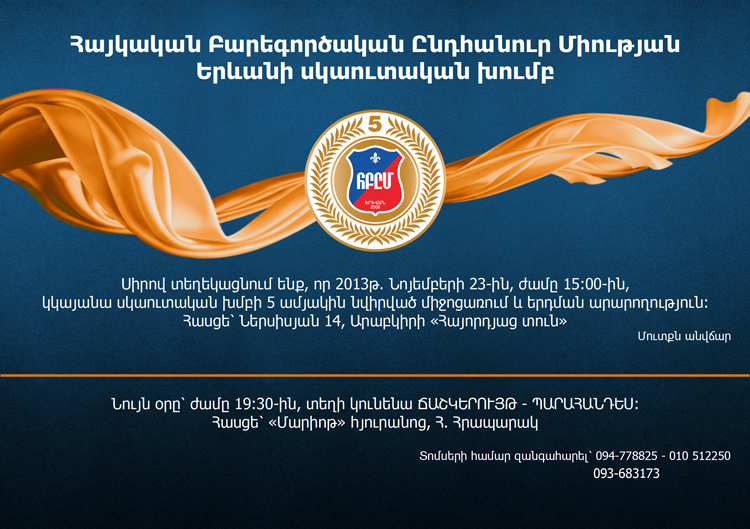 The AGBU "Tarouhi-Hovagimian" schoolchildren from Beirut, Lebanon will visit Armenia on September 6 - 13. The Enrollment starts on August 23 and will end on September 15. AGBU Discover Armenia Farewell Dinner/10th anniversary celebration! The AGBU Discover Armenia Educational Youth Trip will be launched on August 5 and end on August 22. During the program participants visit countrie’s historical and cultural sites and enjoy its picturesque nature, as well as engage in various volunteer projects that contribute to local development. At the end of this three-week journey, participants return home forever transformed, with higher respect for their heritage and with memories that will last a lifetime. Many of the participants visit their homeland again after the program and some of them move to Armenia or Karabakh for permanent residence. The fire ceremony of the AGBU Antranik Scout Camp's second session will take place on August 4. Here the traditional harisa will be prepared with the blessings of a clergyman and served to all the parents and guests. The AGBU France Youth Aid Group "Armenie Terre de Vie" plan to pay a visit to Armenia from August 1 - 30. Second session of AGBU Antranik Scout Camp starts on July 26. Scout groups from Akhalkalaki and Syria will take part in this session. The Session will end on August 5.